Bluhm Enterprises has a all new design of LED headlight conversions for all snowmobiles that come standard with halogen headlight bulbs! This is almost every snowmobile ever made and, the LED is solid state and no moving parts so it will virtually last for the life of the sled! 32 watt CREE GX3 chips from Samsung with a round convex lens simulates filament light to help utilize the entire headlight housing. Over twice as bright as a stock halogen bulb, nearly as bright as a HID kit, but solid state so no headaches. Just plug-n-play and forget it. All types of sockets and power types available for the Ski Doo DC current sleds, Polaris H13 base AC current sleds, Yamaha DC current sleds, and Arctic Cat H4 DC current 4-stroke sleds, and H4 AC current 2 stroke sleds. Prices start at $199.99 for a complete kit. If you have seen or own a new Ski Doo with the aux. LED light bar, or the new Polaris AXIS machines, you have seen the brightness of LED headlights. They are hard to describe. This is the future of lighting and super reliable way to go! This photo shows everything in the kit to replace the stock halogen headlight bulb. You will notice the solid aluminium construction of the bulb housing, it has a copper inner core for super conductive cooling. The small box in line on the wiring is the LED driver box. This box is about a 2" by 3" unit and is about 3/8" thick. Far smaller than a HID type ballast. 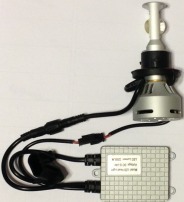 The end connector is a molded plug connector that plugs directly into the factory headlight wiring plug. No modifications at all. Plug in and turn on. Only 32watts!